Buc-ee’s sued Choke Canyon for a variety of claims, including: trademark infringement, dilution, unfair competition, and unjust enrichment. We cover these topics frequently on DuetsBlog (check out the topics column). On Buc-ee’s claims for trademark infringement of its Buc-ee’s Logo, do you find for Buc-ee’s or Choke Canyon? 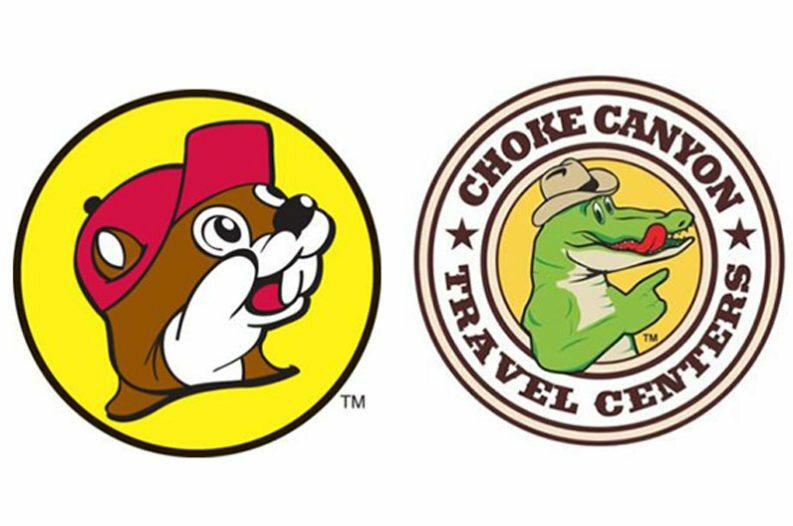 Do you find that Buc-ee’s Logo was famous throughout Texas before Choke Canyon’s use of the Choke Canyon Logo? Because the jury answered “yes” to question 2, they skipped question 3 (which pertained to specific geographic areas in Texas). On Buc-ee’s claim for dilution by blurring of its Buc-ee’s Logo, do you find for Buc-ee’s or Choke Canyon? On Buc-ee’s claim for unfair competition, do you find for Buc-ee’s or Choke Canyon? On Buc-ee’s claim for unjust enrichment, do you find for Buc-ee’s or Choke Canyon? I am surprised by the generality of the questions presented to the jury, and it’s interesting that the jury was not asked about damages–perhaps the issue was bifurcated and will be tried to a different jury. Question 1, and the jury note, suggests to me that the jury was allowed to focus purely on the similarities between the cartoon animals in the above logos, disregarding Choke Canyon logo’s ribbon stating “Choke Canyon Travel Centers.” But even then, the only obvious similarities are the orientation of the mascots, the yellow background, the wearing of a hat, and their smiles and red tongues. It is hard to believe those basic, nominal characteristics are enough to show consumer confusion and infringement. Maybe Choke Canyon has a good chance on appeal or at judgment notwithstanding the verdict. And I cannot help but wonder, in view of Question 2, whether the fact that Buc-ee’s mark was famous throughout Texas prior to Choke Canyon’s use of its alligator mark played the most important role in the jury’s verdict. Perhaps the jury felt that Choke Canyon intended to ride on Buc-ee’s mark. Indeed, at closing argument, Buc-ee’s counsel reminded the jurors that a survey showed more than 80% of Texans recognize the Buc-ee’s logo. But I tend to agree with Choke Canyon’s closing argument that the lawsuit seems directed at stifling competition, rather than truly protecting consumers–pointing to Buc-ee’s own prior statement that it only noticed the potential for consumer confusion when Choke Canyon began buying property in towns where Buc-ee’s operates. I find it hard to believe that a reasonable consumer would seriously confuse the two mascots and think they were associated. But apparently two actual-consumer witnesses testified in Buc-ee’s favor on this point. Texas sure is a strange place sometimes.